In 1827, a French chemist by the name of Leroux extracted a substance from the bark of a white willow tree, which he named "Salicin". This substance is the primary active component of White Willow, and it functions as a pain reliever. A number of years later two other scientists, called Felix Hofman and Fredrick Bayer, identified a related compound to Salicin, and later developed a synthetic version of that compound. This resulted in the development of a commercial product known as aspirin, or Bayers Aspirin. This means that, Aspirin, which is among the most widely used painkillers in the world, is a synthetic derivative of White Willow. However, commercial aspirin has several known side effects including blood clotting interference, upset stomach, ulcers, dizziness, shortness of breath, anemia, and Reyes Syndrome. White Willow on the other hand, or rather the active component in it known as Salicin, does not have these types of side effects. The body naturally converts Salicin to Salicylic Acid, which is gentle to the stomach. In other words, it performs exactly the same functions in the body as Aspirin does but without all the unwanted side effects. Natural White Willow also contains additional organic components, which are not present in aspirin, and these seem to help the body use Salicin without any known harmful side effects. The three main uses of White Willow Bark are for pain relief, to reduce fevers, and as an anti inflammatory herb especially helpful for rheumatism and arthritis. The anti inflammatory properties of White Willow Bark can be used for external application purposes as well. Combining the powdered form with pure aloe vera juice for example, can rapidly shrink problematic, painful hemorrhoids. Additionally you can mix White Willow Bark into a poultice for the treatment of swollen and inflamed ligaments or tendons. Common pain uses of White Willow Bark include anything you would use regular aspirin or other synthetic pain relievers for. These include sore muscles, headaches, earaches, flus and colds. 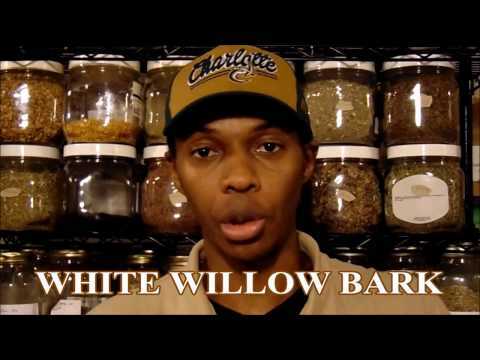 When purchasing White Willow Bark, look for natural or organic types if possible. It should come in a powdered form inside a gel capsule, not a hard packed tablet form since those are likely to have various other things mixed in that may or may not help much. Gel capsules also have a tendency to dissolve in a few minutes, while the hard pill forms tend to have a difficult time being broken down within your body. Consequently, you might not enjoy the full benefits of the herb if taken that way. You will also need to compare the potency of the White Willow you are purchasing, versus your normal pain and fever reducing synthetic medications. Many folks incorrectly assume the white willow is not working because they do not realize they have taken a much smaller dose of it when compared with what they would typically take in the form of aspirin, Tylenol or Motrin.